The ignition must be switched ON to use the wipers. Use only windscreen washer fl uid or plain water in the reservoir: Using radiator antifreeze as washer fl uid is dangerous. If sprayed on the windscreen, it will dirty the windscreen, affect your visibility, and could result in an accident. Only use windscreen washer fl uid mixed with anti-freeze protection in freezing weather conditions: Using windscreen washer fl uid without anti-freeze protection in freezing weather conditions is dangerous as it could freeze on the windscreen and block your vision which could cause an accident. In addition, make sure the windscreen is suffi ciently warmed using the defroster before spraying the washer fl uid. Because heavy ice and snow can jam the wiper blades, the wiper motor is protected from motor breakdown, overheating and possible fi re by a circuit breaker. This mechanism will automatically stop operation of the blades, but only for about 5 minutes. If this happens, turn off the wiper switch and park off the right-of-way, and remove the snow and ice. After 5 minutes, turn on the switch and the blades should operate normally. If they do not resume functioning, consult an expert repairer, we recommend an Authorised Mazda Repairer as soon as possible. Drive to the side of the road and park off the right-of-way. Wait until the weather clears before trying to drive with the wipers inoperative. Turn the wipers on by pressing the lever up or down. 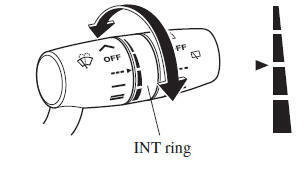 Set the lever to the intermittent position and choose the interval timing by rotating the ring. When the wiper lever is in the position, the rain sensor senses the amount of rainfall on the windscreen and turns the wipers on or off automatically (off— intermittent—low speed—high speed). 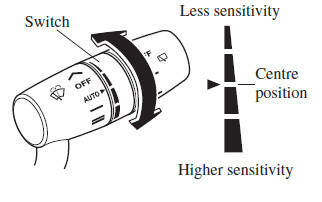 The sensitivity of the rain sensor can be adjusted by turning the switch on the wiper lever. From the centre position (normal), rotate the switch downward for higher sensitivity (faster response) or rotate it upward for less sensitivity (slower response). Do not shade the rain sensor by adhering a sticker or a label on the windscreen. Otherwise the rain sensor will not operate correctly. If the windscreen above the rain sensor is touched or wiped with a cloth. If the windscreen is struck with a hand or other object from either outside or inside the vehicle. is switched ON as fi ngers could be pinched or the wipers and wiper blades damaged when the wipers activate automatically. If you are going to clean the windscreen, be sure the wipers are turned off completely (when it is most likely that the engine is left running) this is particularly important when clearing ice and snow. driving activates the windscreen wipers once, after which they operate according to the rainfall amount. 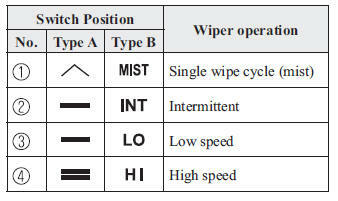 The auto-wiper control may not operate when the rain sensor temperature is about –10 °C (14 °F) or lower, or about 85 °C (185 °F) or higher. If the windscreen is coated with water repellent, the rain sensor may not be able to sense the amount of rainfall correctly and auto-wiper control may not operate properly. If dirt or foreign matter (Such as ice or matter containing salt water) adheres to the windscreen above the rain sensor or if the windscreen is iced, it could cause the wipers to move automatically. 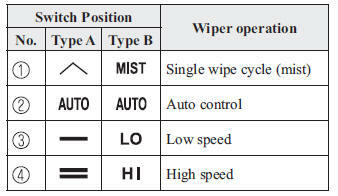 However, if the wipers cannot remove this ice, dirt or foreign matter, the auto-wiper control will stop operation. In this case, set the wiper lever to the low speed position or high speed position for manual operation, or remove the ice, dirt or foreign matter by hand to restore the auto-wiper operation. than when driving the vehicle under rainy conditions. 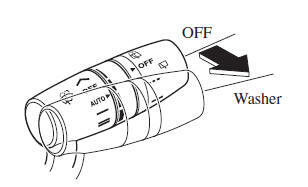 The auto-wiper control functions can be turned off. Pull the lever toward you and hold it to spray washer fl uid. wipers will operate continuously until the lever is released. 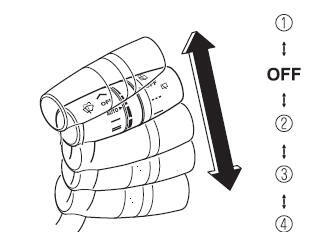 If the washer does not work, inspect the fl uid level (page 6-32 ). If the fl uid level is normal, consult an expert repairer, we recommend an Authorised Mazda Repairer. (With headlight washers) When the headlights are on, the headlight washers operate automatically once every fi fth time the windscreen washer operates. Refer to Headlight Washer on page 4-74 .